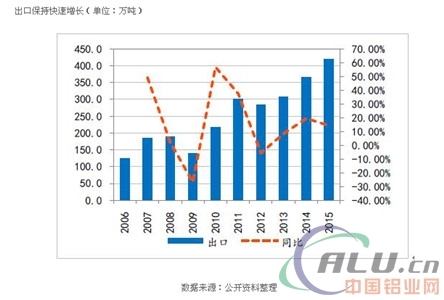 In the past few years, China's aluminum output has maintained a rapid growth trend. 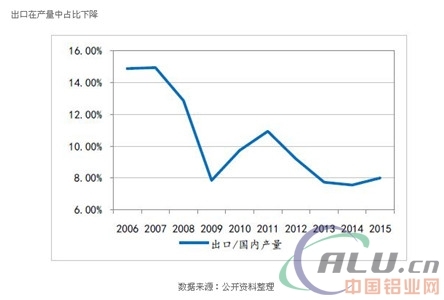 The compound growth rate has reached 18.54% from 2010 to 2015, exceeding the growth rate of electrolytic aluminum production (14.45%) by 4.09 percentage points. As of 2015, China's aluminum production has reached 52.364 million tons. . 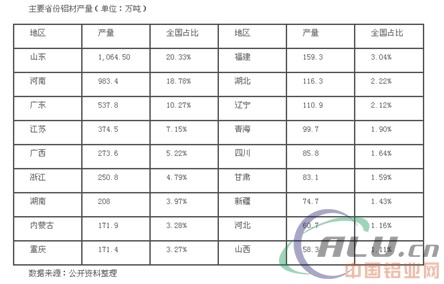 Compared with electrolytic aluminum and alumina, the concentration of aluminum profiles has decreased. Shandong Province is the largest province for aluminum processing in China. In 2015, it produced a total of 10.64 million tons of aluminum, accounting for 20.33% of the national aluminum production. Henan Guangdong has a relatively large volume. In 2015, it accounted for 18.78% and 10.27% of the national output respectively. The remaining provinces showed the characteristics of “small and scattered”. Most provinces have certain aluminum processing capacity, but The volume is relatively small, accounting for less than 5% of national production. In terms of import and export, China's aluminum exports are large in scale and have few imports. In 2015, China exported a total of 4,195,200 tons of aluminum, accounting for 8.01% of domestic aluminum production. Although the proportion of exports showed a downward trend, the absolute amount still maintained rapid growth. The compound growth rate in 2006-2015 was 14.50%. In the long run, thanks to the light weight, corrosion resistance and other properties, there is still room for growth in the future demand for aluminum. Lightweight vehicles, as well as China's manufacturing upgrades, will increase the use of aluminum. Compared with developed countries in Europe and America, China's per capita aluminum consumption still has a large room for growth. 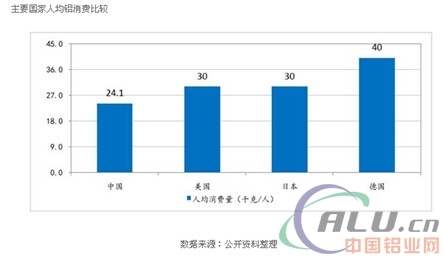 According to the "Non-ferrous Metal Industry Development Plan (2016-2020)" forecast, by 2020, China's apparent consumption of primary aluminum will reach 40 million tons, with an average annual compound growth rate of 5.2%. On the supply side, the electrolytic aluminum industry is also a country with overcapacity in the country. Under the background of resolving the overcapacity of the economy, the policy has clearly controlled the new capacity. The new construction and renovation projects must strictly implement the policy of equal capacity reduction and reduction, and the new supply capacity will be affected by the supply. limit. We believe that in addition to the capacity currently under construction, there will be no new capacity building plans for a long period of time in the future. According to our statistics on the existing electrolytic aluminum production capacity, 46 million tons is likely to be a longer period in China. In the time of the ceiling of electrolytic aluminum production capacity, according to the apparent consumption of 40 million tons, the capacity utilization rate will reach 86.96% by 2020, and the overcapacity will be greatly alleviated, but in 2017, the new alumina and electrolytic aluminum will be added. The supply pressure brought by production capacity is relatively high, and there is downward pressure in the industry. The industry will continue to differentiate within the industry. The existing leading enterprises Weiqiao, Xinfa scale, cost, start-up and industrial supporting advantages have been very strong; Nanshan Aluminum has also established advantages in deep processing; Chinalco Corporation, especially under the jurisdiction In recent years, Chinalco has also been slimming up and improving its layout. At present, it has achieved certain results. It is expected that with the further deepening of the reform, the comprehensive competitiveness of the future will be further enhanced, and it is expected to become a veritable industry leader. Geographically, Shandong's competitive advantage is already very strong; although the electricity reform will weaken the power cost advantage in Xinjiang, it is not realistic to completely shake its cost advantage; while the aluminum enterprises in Henan are generally small, and the overall situation is still Further integration is needed, and there is still room for decline in the proportion of the national aluminum industry.